Zeta risk assessments take account of the inherent risk in your sector to provide a tailored report, formatted using dedicated specialist teams that best suit your working environment. 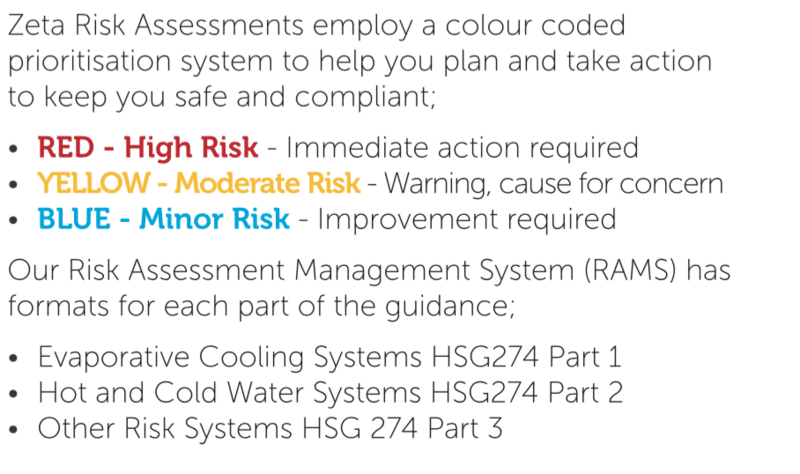 Whether you are in a complex / higher risk scenario such as healthcare or industrial cooling towers or lower risk environments such as retail or commercial premises. Zeta has the ideal solution for your needs. Zeta’s fields consultants use the latest in IT to gather their data in a structured way and with a rigorous QA process this ensures consistency in each risk environment. This allows you to build up your risk history and develop the ‘Living Document’ approach, now advocated by the HSE. Zeta is regulated by the Legionella Control Association to provide risk assessments which follow a methodology in accordance with BS 8580. “Within a short time period and with Zeta Compliance Services’ help, we were able to obtain a complete asset register, barcode all assets and set up a control scheme to monitor and analyse all of our water related assets. ZetaSafe® has enabled us to manage our estates more effectively and efficiently. Any large building looking to manage health, safety and environmental compliance should look to use ZetaSafe®. “Zeta Compliance Services have enabled us to self deliver on several aspects of our management of water hygiene, this has ultimately saved us a significant amount both in terms of time and money.